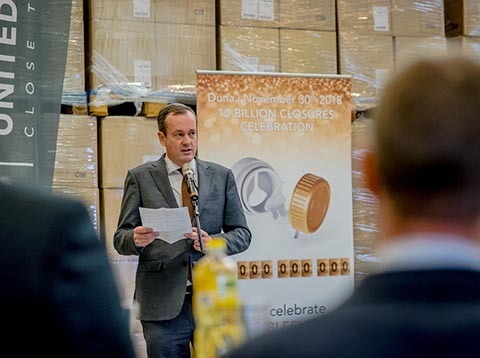 Wiltz, Luxembourg – UNITED CAPS, an international manufacturer of caps and closures, today reported that it held a successful event at its Hungarian plant to celebrate the manufacture of its 10 billionth closure this year, its innovative DOUBLEFLOW closure for edible oils. It is the first time in the company’s history that 10 billion closures have been produced in a 12 month period. Benoit Henckes, CEO of UNITED CAPS at the 10 billionth closure celebration in Dunavarsány, Hungary.